Create your monster’s portrait by reproducing the original portrait as quickly as possible! Someone in the art gallery had fun modifying all the monster portraits on display. What a mess! Will you be able to quickly and carefully change your painting back to its original version? Instead of paint and a paintbrush, you have manycoloured balls which need to be positioned in the right place and in the correct order. 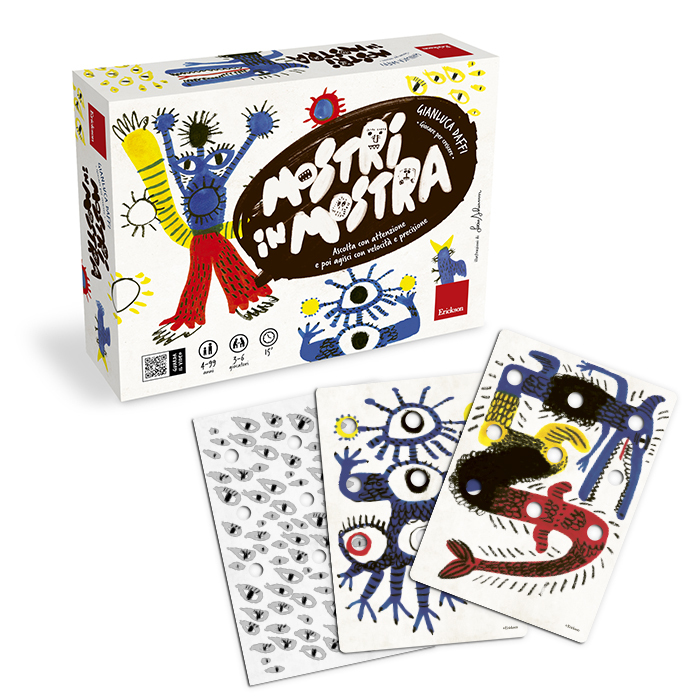 Monsters on show is a game from the “Playing to Grow” series, created by Gianluca Daffi, expert in childhood psychology and university professor. Each game focuses on a specific executive function or a cognitive process with the objective of developing it through play and having fun. Monsters on show, in particular, develops attention span, working memory, and emotional self-control. 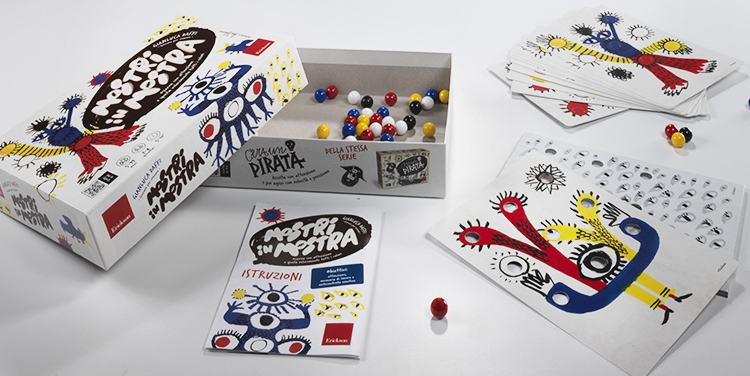 The game is composed of 4 game board frames with holes, 36 coloured balls: 9 balls (2 yellow, 2 white, 2 red, 2 blue, 1 black) for each of the 4 players, 20 cards with 10 monster portraits. 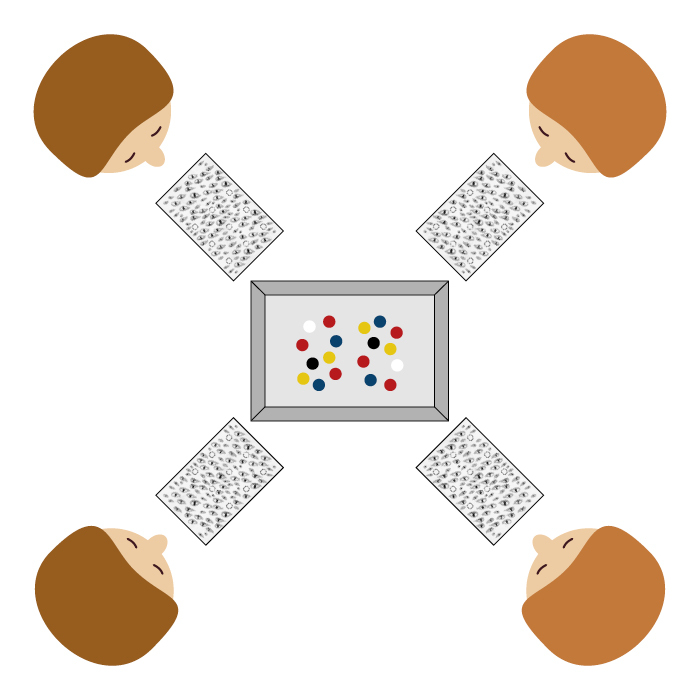 To become an expert painter and place the coloured balls in the right position and in the correct order, following the example of the player who is leading the round. Monsters on show can be played by 2 to 4 players. The recommended age is: 5 years old and up. For each round of the game, one player acts as the leader. To start, each player is given a game board frame. All the coloured balls are placed in the lid of the game box, in random order. The first game leader is the youngest player. The leader chooses a portrait card and places it on his/her game board. 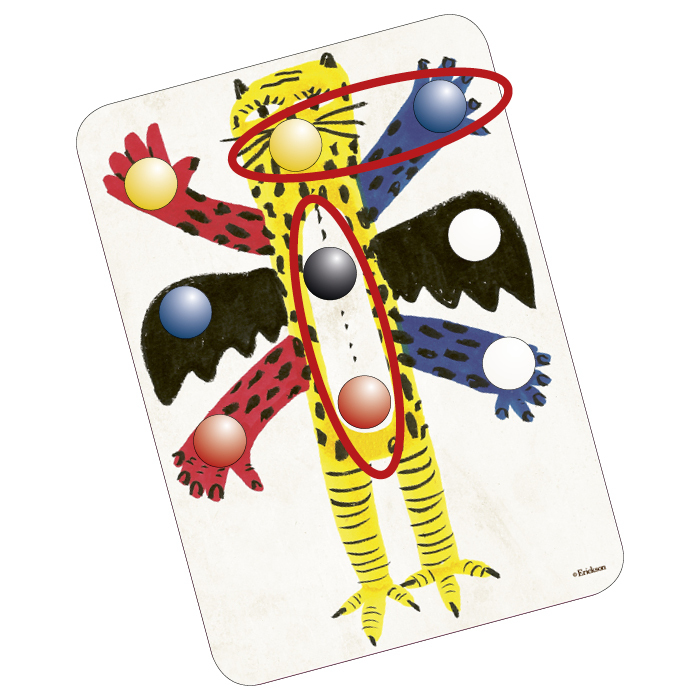 After choosing the portrait, the leader – without being seen by the other players (using the game box as a barrier) – places his/her 9 coloured balls in the holes on the game card in whichever manner he/she prefers. The other players pick a monster portrait card and place it on their game board. The leader “uncovers” the original monster for the other players to copy. 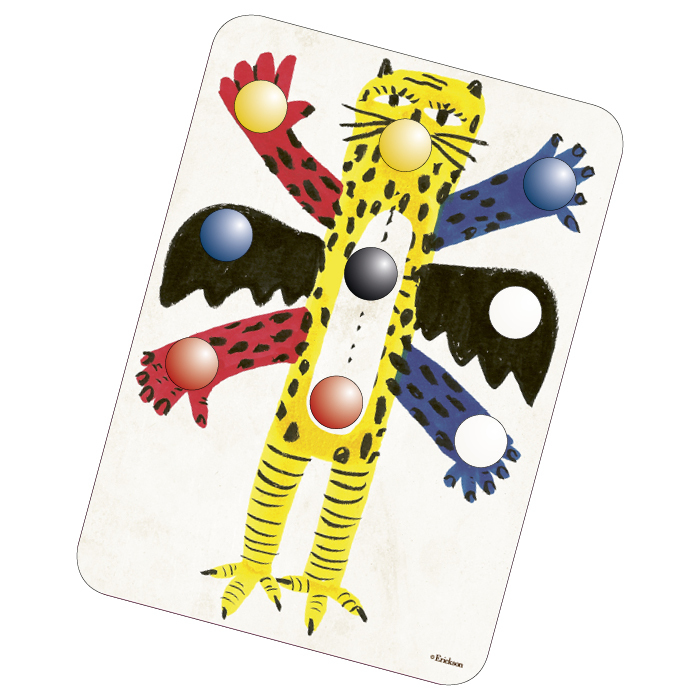 From the moment the leader reveals his/her monster’s portrait, the other players must recreate the same arrangement of coloured balls on their own portrait, using only one hand and picking up only one ball at a time. The first player who completes his reconstruction shouts “Monsters on display!” and the game stops. If the reconstruction is correct, the players move on to the next phase of the game. If the reconstruction is not correct, then the compositions of the other players are checked (in finishing order) until someone who has completed the composition correctly is found. The first player to correctly complete the reconstruction becomes the new game leader. At this point, the new leader will cover his/her game board with the box lid and change the place of 1, 2, or 3 balls, thereby modifying the order of the colours. The game leader “uncovers” the portrait to be copied by the other players by lifting up the barrier. At this point, the other players have to reconstruct the same organization of the balls, modifying the position of the balls on their own portraits according to how they have been moved by the leader. The first player to complete his/her composition correctly and shout “Monsters on display!” stops the game. Then play follows the same procedure as above.loop the colour of elastic indicated by the dice around their thumb.